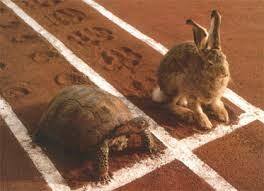 We all know the story of the Turtle and the Hare, and the reasons why Turtle wins the race. Today is National Turtle Day (who knew!). As a leader there is pressure to make quick decisions and we often look for tips and insight on how to win against the competition. This week, why not try slowing down for the major decisions and instead, take the time to make the best decisions. Slow and steady really can win the race. TED | Joachim de Posada: Delayed Gratification – Don’t eat the marshmallow! “It is not necessary for all men to be great in action. P.S. Did you know that CareerJoy’s Leadership Identity Program can help your company identify and develop your employees with emerging leadership potential? Our team has all the tools you need to bring your talent development strategy to the next level. P.P.S. Are you ready for Workforce 2025? Join the Association of Career Professionalsin Toronto hosted by our very own Jill Kirson on June 3rd for their season finale as they host Kristina Hidas of the HRPA. From networking, to a light buffet, and a presentation on thriving in a changing world, this will surely be an evening to remember!.